PHPBB is one of the most popular forums scripts available in php scripting language. Although the default phpBB template is nice and clean, you can choose to customize it to match the look and feel of your website. This allows you to modify your forum to better merge in your websites theme. The best part is, the templates are all held in files separate to the code, so you don’t need to know how the forum works to change it’s aesthetics. You must consider backing up your files before making such changes. 1. Login – The first thing you need to do is FTP into your site. 2. Know your default style. Login to phpbb admin section and go to STYLES tab. All installed styles are listed here. Your active and default style is marked with asterisk (*). 2. 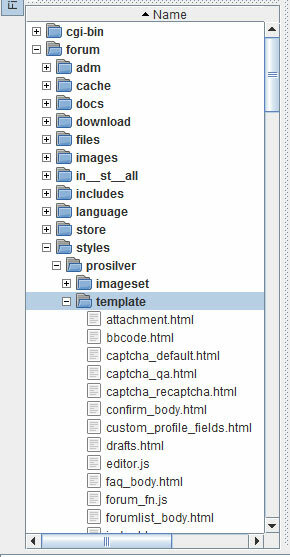 Find the current template files – From your forums main directory, it is by default in the styles /prosilver/template (prosilver is the name of the default template in use here). 6. Other Pages – While the configuration files and header/footer files are global and apply to all the pages, the layout of many individual pages can also be customized. Each of the .html files in this directory corresponds to a page of your forum. For example, index_body.html is the template for the Home page, and search_body.html is the template for the search page. 7. Clear Cache before you could see changes – When you make changes to template files changes are not reflected at forum front end unless you clear cache for the template files. For example, if you make changes to overall_header.html file you must delete the cache file for header file, from the admin end. As shown in the image below, in PHPBB3 we go under to Styles Tab then click Templates link under STYLE COMPONENTS which takes us to a list of Templates in use. Next to default template in the list click “Cache and” then check the checkbox shown next to template file name and press “Delete Marked” button at the bottom. Once deleted you should go to front end of the forum and test your changes.